This raw, unprocessed image was taken by NASA's Cassini spacecraft on May 2, 2012. The camera was pointing toward Dione at approximately 14,835 miles (23,875 kilometers) away. Dione is the fourth-largest moon of Saturn, with a diameter of 698 miles (1,123 kilometers). It is the 15th largest moon in the solar system. Dione orbits around Saturn once every 2.7 Earth-days, at a distance of 234,000 miles (377,400 km), approximately the same distance from Earth to its moon. With its wispy terrain and mysterious cratering, Dione presents an intriguing puzzle. One of the 53 named satellites orbiting the ringed planet, the icy moon has a number of features that make it stand out. Some scientists say Dione is a weaker version of the geyser-spewing Enceladus, another moon of Saturn; in 2013, a study suggested that there could be an ocean underneath Dione's surface (based on a weak particle stream detected by the Cassini spacecraft's magnetometer, and images of the moon's surface). 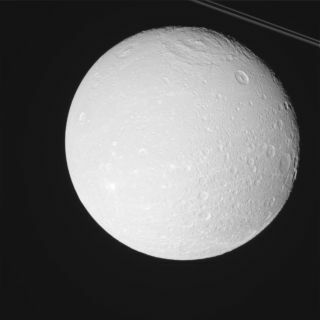 Dione was the fourth of Saturn's moons to be discovered, the third by Giovanni Cassini. The Italian astronomer found the moon in 1684 while studying Saturn from the Paris Observatory. Cassini referred to it as one of the Sidera Lodoicea, the "Stars of Louis," named after King Louis XIV. Other astronomers named the moons numerically, based on their distance from the planet, making Dione Saturn IV. This view highlights tectonic faults and craters on Saturn's moon, Dione, an icy world that has undoubtedly experienced geologic activity since its formation. It is based on images from the the Cassini spacecraft taken on Dec. 24, 2005. The icy satellite did not receive a formal name until 1847, when John Herschel (son of British astronomer William Herschel) suggested the moons of Saturn be named for the Titans, brothers and sisters of the Greek god Cronus, who was known to the Romans as Saturn. In Greek mythology, Dione (pronounced "die-OH-nee") was often described as the daughter of Tethys and Oceanus, and resembled the earth goddess Gaia. In his epic poem, "The Iliad," the Greek poet Homer described her as the mother of Aphrodite, goddess of love, and suggested that she was the mother of many others. Geological features, such as craters and cliffs, take their names from people and places in Virgil's "Aeneid." Dione's surface contains both heavily and moderately cratered regions, with some craters as large as 62 miles (100 km). But Dione is something of a puzzle due to the location of its heavily cratered areas. Generally, the leading hemisphere of a body traveling through space plows face-on through debris, and is more heavily cratered. Dione, however, has a more heavily cratered backside than front. Scientists have speculated that a collision could have spun the moon around — an impactor that created one of the 22-mile (35 km) craters could have had the force to turn the moon — but the fact that it seems to have spun exactly 180 degrees is unusual. Dione is 1.48 times as dense as water, suggesting that the moon has a dense core surrounded by ice or water. The temperature on the moon averages minus 302 degrees Fahrenheit (minus 186 degrees Celsius). The exceptionally cold temperatures cause the icy surface to behave much like rock. When Voyager 1 surveyed the moon in 1980, it unveiled wispy features on the trailing side. NASA's Cassini-Huygens probe took close-up images more than 20 years later that revealed the wisps were ice cliffs. As dark material fell from the cliffs, they revealed brightly shining ice underneath. Created by tectonic activity, these fractured areas crisscross the moon, running tens to hundreds of kilometers in length. Cassini also detected a wispy oxygen atmosphere on Dione. It is very thin; there is just one oxygen ion for every 0.67 cubic inches (11 cubic centimeters). It is equivalent to conditions 300 miles (480 km) above Earth. A 2016 presentation at the American Astronomical Society suggested that some of the moons of Saturn, including Dione, could have been hit by debris from a previous generation of moons. Dione's craters have also been studied for signs of change, such as a separate 2016 Icarus study of the ray system of Creusa crater. The team observed that some of the ejecta rays have been erased over time due to erosion from dark particles (which could be the same material seen on other moons such as Hyperion and Iapetus). Other contributors to the erosion likely were plasma and E-ring particles, the article noted. Dione may hide a subsurface ocean beneath its surface. According to a study made by the Royal Astronomical Society of Belgium, gravity data from Cassini flybys could be explained by an ocean 60 miles (100 km) beneath the surface. The ocean is tens of kilometers deep and surrounded by a large rocky core. Dione's ocean would have formed with the moon, remaining liquid over more than 4 billion years. The close contact between water and rock, along with its extensive age, would make it an excellent breeding ground for microbial life. "The contact between the ocean and the rocky core is crucial," Attilio Rivoldini, co-author of the study, said in a statement. "Rock-water interactions provide key nutrients and a source of energy, both being essential ingredients for life." Dione wouldn't be the only Saturnian moon to host an ocean. The icy world Enceladus, which sports geysers at its southern pole, contains one, as does the smoggy moon Titan.